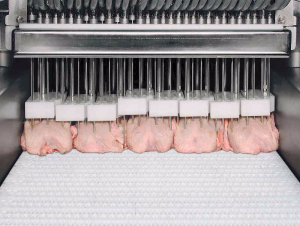 Processors in the beef, pork, and poultry industry use brine injector systems extensively and presents cleaning challenges: The brine solution itself can be contaminated and the injector needles can transfer bacteria to carcasses. 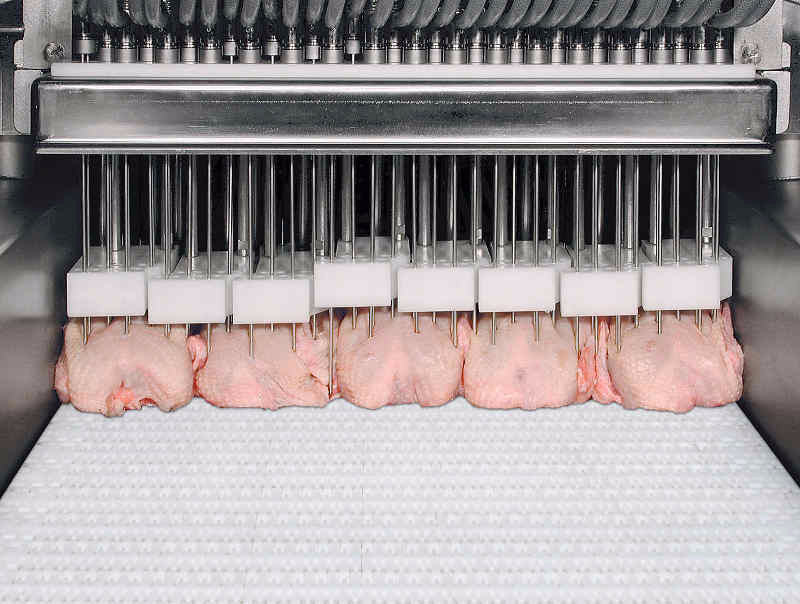 Also, the needles collect tissue, fat, etc as they inject brine into the carcasses. A major benefit that all food processors will benefit from is an improvement in product shelf life ! The protocols listed below detail how to use Realzyme’s enzymatic detergents for both regular, everyday cleaning as well as for cleaning when there is a severe contamination, including biofilm issues. Prepare the CIP cleaning solution using a 1% concentration (1.3 oz/1 gallon ratio) of DEGRES L.
Run solution through system for (1) hour. As a final step, apply an oxidizing-based disinfectant/sanitizer at a minimum of 400-500 ppm. Cycle this through the system for a minimum of 10-15 minutes. 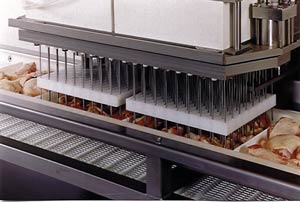 The use of an oxidizing-based product when properly used is critical to achieve a proper kill step and full deactivation of any remaining enzymes. Prepare the CIP cleaning solution using 1% concentration (1.3 oz/1 gallon ratio) of DEGRES L and 0.2% concentration (0.26 oz/1 gallon ratio) of BIOREM CD20. Run the solution through system for (1) hour.